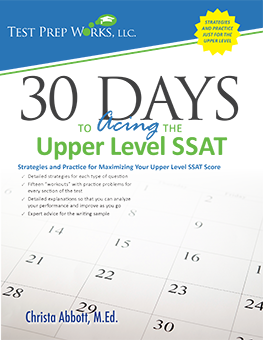 Test Prep Works has updated several of its SSAT prep books for 2017-18 and introduced a brand new book of practice tests for the Middle Level SSAT. These books have been developed after a thorough analysis of the Official Online SSAT Practice Program released in 2016 and previous print editions of the The Official Guide to the SSAT. We also spent time in the field this year listening to your experiences with the SSAT and wishes for SSAT prep materials, and the revisions we’ve made are the result. We have three books available for the Upper Level SSAT. Each of the following links will bring you to the Amazon.com page where the book is available for purchase. Additional configurations for educators familiar with these materials are described at the bottom of the page. Success on the Upper Level SSAT — A Complete Course: The math sections of this book have been updated for 2017-18 with additional instruction and practice for advanced algebra and other topics introduced by The Enrollment Management Association in 2016 with the Official Online SSAT Practice Program. This book can be used to teach one-on-one or in a group setting. It includes vocabulary lessons, complete strategies for each section (including quick drills to reinforce concepts), and in-depth content instruction for the math section including practice sets that can be assigned for homework between lessons. This book also includes one full-length practice test. 30 Days to Acing the Upper Level SSAT: This book includes 15 workouts that are perfect for assignments between sessions. Each workout takes about half an hour and includes vocabulary and practice for each of the multiple-choice sections. 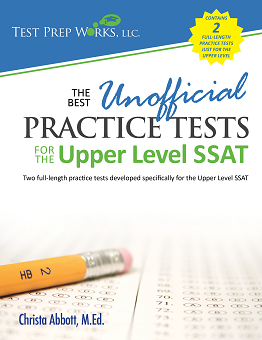 The Best Unofficial Practice Tests for the Upper Level SSAT: This book contains 2 additional full-length practice tests for the Upper Level SSAT. The practice tests in this book have been revised for 2017-18 based on the latest materials released by the test writers, including an expanded set of algebra and other math topics introduced with the Official Online SSAT Practice Program released in 2016. These tests will give you an idea of the types of questions you will see, the concepts that are being tested, the format and timing of the test, and how the scoring works. Please note that these tests are neither produced nor endorsed by The Enrollment Management Association. We have two books available for the Middle Level SSAT. Each of the following links will bring you to the Amazon.com page where the book is available for purchase. 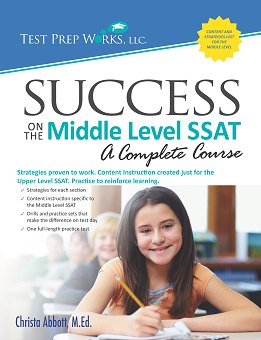 Success on the Middle Level SSAT — A Complete Course: Like the complete course book for the Upper Level, this book includes vocabulary lessons, complete strategies for each section (including quick drills to reinforce concepts), in-depth content instruction for the math section including practice sets, and a full-length practice test. A revised edition for 2017-18 is greatly expanded based on a thorough review of the most recent official materials, including the Official Online SSAT Practice Program released in 2016. This book includes a number of new or expanded math topics, including a much stronger emphasis on algebra. 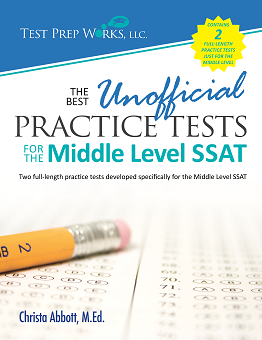 The Best Unofficial Practice Tests for the Middle Level SSAT: Newly introduced for 2017-18, this book contains 2 full-length practice tests for the Middle Level SSAT. The practice tests in this book are based on the latest materials released by the test writers, including an expanded set of algebra and other math topics introduced with the official online SSAT practice program released in 2016. These practice tests will give you an idea of the types of questions you will see, the concepts that are being tested, the format and timing of the test, and how the scoring works. Please note that these tests are neither produced nor endorsed by The Enrollment Management Association. Additionally, please sign up below for our Educator’s Newsletter, which will alert you when additional materials become available. All of our materials can be customized with your school or company’s logo and cover art. See the How We Work page for more details. We offer volume discounts for orders of 25 or more books. To receive the discount, the order must be placed directly with Test Prep Works and not through Amazon.com or other retail channels. Please send an email to sales@testprepworks.com with the titles and quantities you would like to order and we will respond with a quote. Content from the books listed above have been combined in different ways to create the materials below. These configurations are not available through other retail channels. (Note – These additional configurations have not yet been revised with the updates for the 2017-18 season. These updates will be available in early September.) Email sales@testprepworks.com for more information or to order. 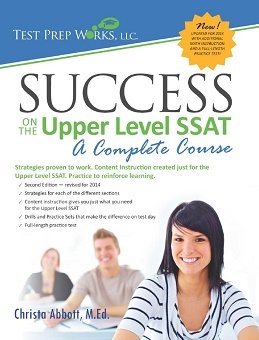 Success on the Upper Level SSAT — Special Edition with Three Full-Length Practice Tests: Includes all of the content from the regular edition of the book plus two additional practice tests, for a total of three. The additional practice tests are the same ones found in The Best Unofficial Practice Tests for the Upper Level SSAT, so combining the two books will result in duplicated content. The Best Unofficial Practice Tests for the Upper Level SSAT — Special Edition with Three Full-Length Practice Tests: Includes the two practice tests from the regular edition of the book plus one additional practice test, for a total of three. The additional practice test is the same one found in Success on the Upper Level SSAT, so combining the two books will result in duplicated content.